Pallas Kunaiyi-Akpanah powers up two points. Photo courtesy of Northwestern Athletics. She began playing basketball at 14 and has had the men’s basketball coach at Northwestern naming drills after her. She’s a quiet leader who does stand up comedy – an instinctive athlete who wants to outwork everyone. Her journey might not be typical, but Wildcat senior post Pallas Kunaiyi-Akpanah always seems to be in the right places at the right times. Kunaiyi-Akpanah finished her career as one of the best rebounders in Big Ten history. Her 381 boards last season ranked fourth all-time in league history. She continued that pace this year, finishing third in the conference in rebounds and 13th in the nation, and she will have a chance to add to her totals tonight, as Northwestern hosts Dayton in the first round of the WNIT. Teammate Lindsey Pulliam said Kunaiyi-Akpanah dominates under the basket because she is singularly-focused. Wildcat coach Joe McKeown said Kunaiyi-Akpanah’s skills come naturally to her. As an ESPN top-100 recruit coming out of a college preparatory and boarding school about two hours outside of Atlanta, it’s no surprise that Kunaiyi-Akpanah has performed so well in college. But becoming a top prospect was quite the journey. She was born in the Nigerian capital of Abuja, and attended a boarding school a few hours away from her hometown. This limited her time with her family and forced her to grow up quickly. She was 14 when she began playing basketball, and received her break that same year. She was playing at an outdoor court when Hope 4 Girls Africa founder Mobolaji Akiode discovered her. Akiode created the basketball camp in West Africa to increase participation and empowerment of women in Africa through sports, and he often placed them into U.S. schools. While Kunaiyi-Akpanah was still new to basketball, her upside was obvious. “I was a skinny, 6-1 girl, so I think she saw that,” she said of Akiode. Kunaiyi-Akpanah joined the program, and Akiode, who played basketball at Fordham University, quickly looked for a place in the United States for the teenager to improve her game. She enrolled as a sophomore at Rabun Gap-Nacoochee School, a college preparatory and boarding school in Georgia in early Oct. 2012, as more of an athlete than a basketball player. She quickly made her mark on the school, joining the tennis, track and field and volleyball teams, in addition to the basketball team. Although she was raw, her skills improved every year. Through her performances for both her high school and summer teams, she eventually began receiving interest from major college basketball programs. “I didn’t even know I was getting attention until I got back to school and had two trash bags of letters from colleges,” she said. When McKeown came to Rabun Gap to scout Kunaiyi-Akpanah, he found her on the court – but it wasn’t the one he expected. When McKeown finally saw her on the basketball court, he saw a player with a high ceiling who needed a lot of work. Kunaiyi-Akpanah eventually committed to Northwestern, focusing on both its basketball team and great academics. “You can have okay academics and a great team and I respect that, but having great academics too is really cool,” she said. Despite still being relatively new to the game, it was clear Kunaiyi-Akpanah could play. 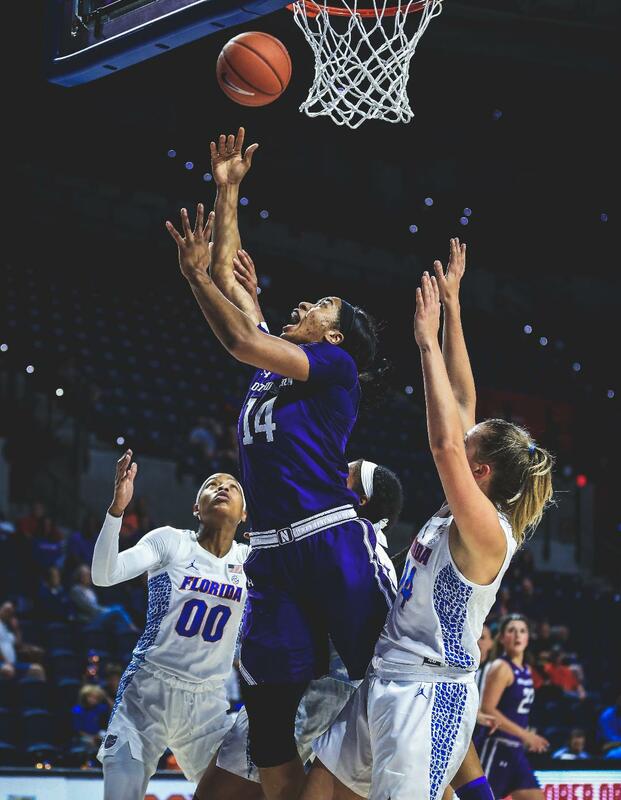 She averaged almost eight rebounds her freshman year in Evanston, including a span from Jan. 28- Feb. 6 of her freshman year, where she grabbed 16 rebounds against Ohio State, 13 rebounds one week later against Illinois, then 16 more two days later. The game against the Buckeyes stood out to McKeown as a breakthrough for the young player. After a down sophomore year, Kunaiyi-Akpanah had a historic junior year. She was second in the Big Ten with 11.9 rebounds per game, and her 18 double-doubles were eighth in the nation. Her games became that of legend, and that brought extra fans to watch the Wildcats. After the record year, Kunaiyi-Akpanah didn’t let raised expectations bother her. She was named a captain, winning the consensus of both the players and the staff not through her words, but her actions, according to McKeown. “She does it in a very quiet way, with her practice habits and her personality. She tries to do the right thing every day, on and off the court,” he said. Kunaiyi-Akpanah was excellent throughout the year, being named First Team All-Big Ten by the media alongside her teammate Pulliam, after finishing third in the conference in rebounds and 13th in the nation with 11 rebounds, while increasing her scoring to 11.1 points. She’s been so impactful during her career that Northwestern’s men’s head coach Chris Collins took notice. She is particularly effective on the offensive glass, grabbing 4.9 offensive rebounds a game – fourth in the nation – and does such a good job keeping possessions alive that some of her teammates joke she misses shots on purpose, just to get the rebound. Pulliam, the third0-highest scorer in the conference, added that Kunaiyi-Akpanah’s rebounding skills do more than just grab boards; they help the psyche of her teammates. 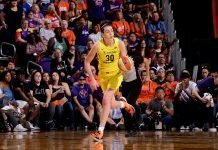 “You know any time you put up a shot and if it comes off, there is a chance Pallas is knocking her hands on it, so for sure it makes it a lot easier to take the shots that I do,” she said. Off the court, Kunaiyi-Akpanah has made sure to get involved with the Northwestern campus, including, Pulliam said, performing stand up comedy this year during a talent show. Kunaiyi-Akpanah finished the regular season with 318 rebounds, which was enough to put her at 1,021 career rebounds – the 19th most in Big Ten history. She became the 23rd player in conference history to record 1,000 points and 1,000 rebounds. As the Wildcats prepare for tonight’s game, Kunaiyi-Akpanah will have a chance to add more rebounds and potentially even a championship to an already-illustrious career. Yet to her, the numbers will never be how she is defined. “I’m most proud of the image of myself I have been able to put forward to people,” she said. Kunaiyi-Akpanah is set to graduate this year, and is hoping to continue playing basketball, whether in the WNBA or Europe. It’s a long way from the basketball court in Abuja, Nigeria, where she picked up the sport about seven years ago. While Kunaiyi-Akpanah is unclear what the future hold, her past proves she’s in the right position.